The effects of global climate change taking place in the Arctic may influence weather much closer to home for millions of Americans, researchers report. The United States has experienced many changes in severe-weather behavior over the past decade, including fewer tornado touchdowns in than in the past. A new study suggests that atmospheric circulation changes that coincide with a loss of Arctic sea ice may be partly to blame. Atmospheric scientists from the University of Illinois at Urbana-Champaign and Purdue University report their findings in the journal Climate and Atmospheric Science. 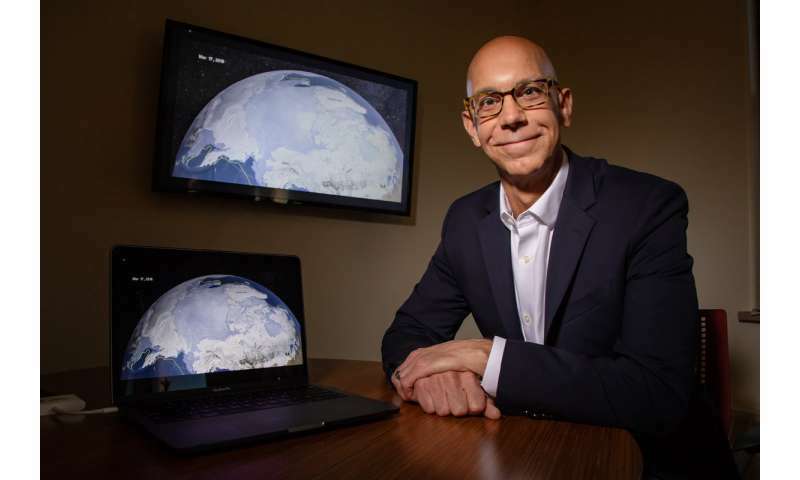 "A relationship between Arctic sea ice and tornadoes in the U.S. may seem unlikely," said (Robert) Jeff Trapp , a professor of atmospheric sciences at the U. of I. and a co-author. "But it is hard to ignore the mounting evidence in support of the connection." The researchers performed statistical analyses of nearly three decades of historical weather and climate data and found significant correlations between tornado activity and the extent of Arctic sea ice—especially during the month July. The team believes that the reduction in tornado activity boils down to how the diminishing Arctic sea ice controls the path of the jet stream. As Arctic sea ice retreats, the jet stream migrates from its traditional summer path over states like Montana and South Dakota to areas farther north, and the atmospheric conditions that are favorable for tornado formation follow suit. "Tornadoes and their parent thunderstorms are fueled by wind shear and moisture," Trapp said. "When the jet stream migrates north, it takes the wind shear along for the ride, but not always the moisture. So, even though thunderstorms may still develop, they tend not to generate tornadoes because one of the essential ingredients for tornado formation is now missing." The team believes that the correlation between Arctic ice retreat and jet stream migration may lead to advances in seasonal severe weather prediction. "One of the reasons that we focused on sea ice is because, like the ocean and land, it is relatively slow to evolve," Trapp said. "Because sea ice and the atmosphere are coupled, the response of the atmosphere is also relatively slow. We can use this property to help make long-term predictions for tornadoes and hail, similar to the way predictions are made for hurricane seasons." But before doing so, Trapp said they still need to understand the drivers of the sea ice changes and what role the tropics may be playing. It remains unclear as to why this correlation is particularly dominant during the month of July, the researchers said, and they admit that they are only at the tip of the iceberg in terms of understanding the overall effects of climate change, and climate variability, on severe weather.